I wrote this the day I came home from the hospital. I didn't want to forget any moment of how I felt that day. I really enjoy writing and feel my true personality comes out when I put words on paper, but this time, writing this, I felt different. Like I was telling someone elses story. It was only 3 days later and yet, writing my story I felt a disconnect from the feelings I was writing. Looking back now, 3 weeks later, I think I was still in shock, still trying to grasp my new life. I was confused. I had a beautiful baby in my arms and emotions I had never had to face before. It was overwhelming. Writing about the day Ella was born is the hardest thing I have ever had to do. On that day our lives changed forever. Having a baby always changes your life, but having a special needs baby and being forced into this new reality is surreal. I hated being pregnant, everyone knew that. It was a tough 9 months. From throwing up constantly to bedrest. I hated every minute of it. The only thing I liked was feeling her move in my stomach. It was a little secret her and I shared. I would be complaining about money, or bed rest or anything, and she would give a little kick and I would stop and smile. It was her way of kicking me out of my funk and it worked. Had I known then what I know now, I would have cherised every minute of being pregnant and her being safe from this cruel world in my belly. My birth was amazing. I had never experienced true "labor" before. I was induced with my other 2 kids and had the epidural before I even really felt a contraction. This time, I went into labor on my own and felt these contractions that were awful, but so amazing at the same time. Mike and I were a little team ready to meet the contraction waves and time them and get through it together. It was such a great birth that it almost made what happened afterwards seem even more like a dream. The moment Ella was born, I held her amd compared her tiny features to my other kids. She had Ryan's lips and Reed's nose. She was little like Reed and just perfect looking (in that new born baby perfect way). I cried over the fact that I just gave birth and that she was finally here. It was a long pregnancy. From severe morning sickness to preterm labor, hospital stays and bed rest, the 37 weeks felt like years. It took a toll on the whole family, but now, finally Ella Lynn was here and perfect and our lives were all going to be back to normal. I think my tears were as much for the pain of giving birth as they were for being happy that the pregnancy chapter was now closed. About 20 minutes after she arrived, all the sudden the dr's whisked everyone from the room and said they needed to talk to Mike and I alone. It was a weird feeling. I didn't get the feeling something was wrong, I thought that maybe this was what they did with all new babies. A little bonding time with Mom, Dad and the baby. My Dr. was standing at my side and there was a nurse practitioner I had never met standing next to her. I started to get a little worried. Why were they standing so close? The Nurse Practioner blurted out words that,while they didn't exactly make sense to me, made me shake. "Your baby has Down Syndrome". I went numb, I started sobbing immediatly. Giant, heaving sobs with a sound that I don't remember ever hearing my body make before. I kept telling Mike I was sorry and asking when I would wake up from this bad dream. I think she kept talking, showing us the "markers" that made them certain she had Down syndrome and telling us everything was going to be all right. People would talk to us about it, blah blah blah. This is really what I heard, words mixed with just noises coming out her. I am sure she said things that made sense and were meant to comfort us, but all I heard was my life was over. I didn't want this, I wanted a healthy baby. I kept repeating over and over that this was a dream, that I didn't want this to happen. I was watching my super strong husband cry along with me. It was the worst day of my entire life. 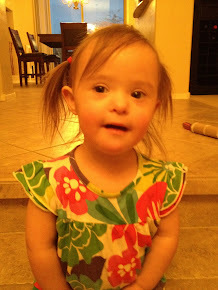 I had just delivered this beautiful baby, who to me, looked just like my other two kids and you tell me she has Down syndrome? It didn't compute with me. I cried and held on to Mike so tight I thought my fingers would break and felt bad for myself and thought my life was over. I wish I could tell you all of what the nurse and Dr. said, but I don't remember a single thing of that. I hated them right then. I hated that they had healthy babies and that they got to go home to their perfect families. I hated everything. I don't remember if I was holding Ella or not, I don't think I was, but I don't remember. I remember the dr's faces and Mike sitting so close and holding me so tight, but I don't remember where Ella was right then. I now hate that I don't remember who was holding her. I hate that at that moment I was thinking about myself and not her. We had our family come back and we told them and we sobbed some more and it was all around miserable. I cried and cried for everything I felt I had lost. I kept thinking my life was over. All the things we do, travel, go out to eat, play in the backyard, swim, it was all gone. I wanted to give her back. I wanted nothing more then to just go to sleep and wake up tomorrow and have this all be a dream. I kept thinking they were wrong. This wouldn't happen to Mike and I. We had a perfect life. I am only 30. I had some testing done to rule this out (and they did!!). I hated everyone who kept coming into our room and asking if we were OK. No, we aren't OK. We will never ever be OK again. At this point, Mike and I had been up for about 30 hours. If the news we had just received wasn't enough, we were dealing with exhaustion and just the pregnancy hormones in general. It was all really overwhelming. I would say that I cried and sat and stared into space for a good 5 hours. It was just so much to take in. I knew nothing about Down syndrome. I hardly remembered how to take care of a baby and now I have to add this? It will always be one of the worst days of my life. Not because I don't love Ella, but hearing your child is going to be different than the other kids is the hardest thing to ever hear. Parents don't want their kids to suffer or be different. Life is already so unfair, why make it harder. We delivered a beautiful baby girl, but we also found out our lives would forever be different. How do you sort out those emotions? Why was I being so selfish and worried about my life. What about hers? I thought all of these things and I thought them over and over again. Like a highlight reel that wouldn't stop playing in my mind of all these emotions. It was hard to take. I remember they gave me a pill to help me calm down. It didn't work one bit. I kept thinking about the things Ella wouldn't experience. Date's, driving, cheerleading, calling her brothers from a party because she drank to much and was scared to call mom and dad. I just wanted her to be like the other girls. My family and best friend Erin were the reason I didn't get up from that hospital bed and run away. They each told me they loved us and they loved Ella and we are a family and together it would all be OK. Erin ran out and got me a book on Down syndrome, Brigid told us about other kids at her school with Down syndrome who were just awesome and thriving in a mainstream school environment. My mom called and broke the news to my Dad so I didn't have to go through it again and just sat by my side and admired Ella with me. Mike's mom was so calm (a little unlike her.) and just said that all was going to be fine. She hugged her son and was so strong for him. It was like we all just came together and formed this bond - a bond for Ella. My dad flew in (I told him not to, but he knew we needed him and was there so fast) and everyone just made Mike and I feel like life wasn't over, it was all going to be just fine. We were really blessed to have our night nurse be a wonderful woman by the name of Mary Sullivan. By some act of God, Mary picked up an extra shift and worked that first night as my recovery nurse. Mary has 9 kids and her youngest has Down syndrome. It was as if someone knew we needed to talk to someone who had "been there / done that" and would be able to answer the questions we had. Mary is an awesome person and telling us about her daughter Kara is what got us through that first night. I will never, ever forget Mary and I hope to be friends with her and her family as we go through this journey. Mike and I aren't religious people, but Mary was a blessing from God for us. She made me realize that the way I felt was OK and normal. There is a mourning process you go through and that is totally OK. That helped us so much.